A smallholder cocoa farmer gathering her harvest. Photo by Wilma J. Blaser. Meeting growing worldwide demand for cocoa products requires sustained production of cocoa beans, which requires healthy soils, effective control of pests and disease, and adaptation to new climates. 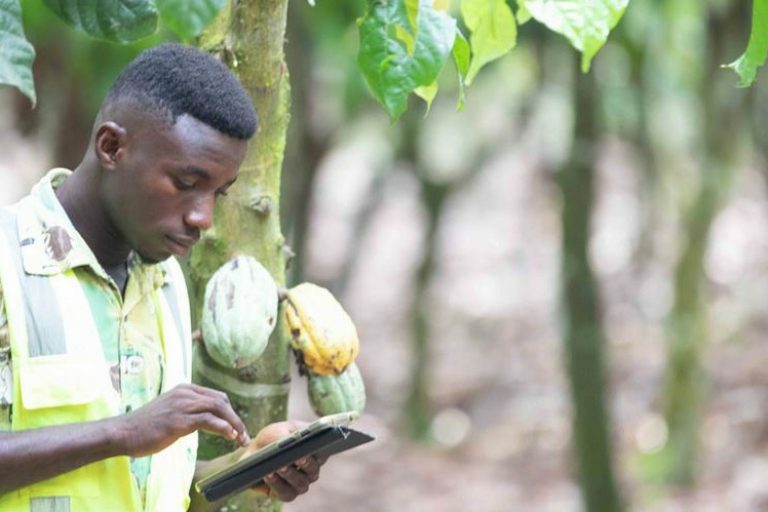 Including shade trees in cocoa systems – a production approach known as agroforestry – could help to simultaneously solve each of these problems. Moreover, shade trees in agroforests have the additional, value-added benefit that they can provide other important ecosystem services such as the conservation of biodiversity, mitigating against future climate change by sequestering atmospheric carbon, and providing alternative incomes through timber and fruit production. However, including shade trees in cocoa production systems also comes with costs because shade trees compete with cocoa trees and thus reduce cocoa yields. Therefore, if agroforestry is going to be an effective solution for cocoa production in the future, it is critical to understand the balance of agroforestry’s costs and benefits for production, climate, and conservation goals. Which level of shade simultaneously meets multiple production and sustainability goals? 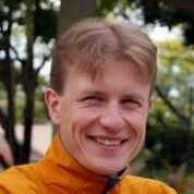 While there have been some very good studies on the trade-off between agricultural yield and biodiversity, or agricultural yield and carbon sequestration in agroforests, there has been no definitive answer on the appropriate level of shade that can best meet multiple goals at the same time. 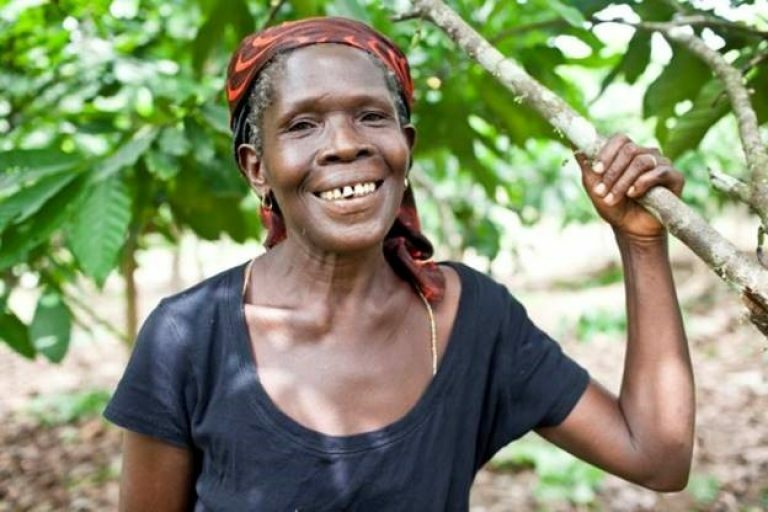 This is a problem because it means that farmers and other stakeholders in the cocoa industry have had little guidance on how to implement cocoa agroforestry most effectively. 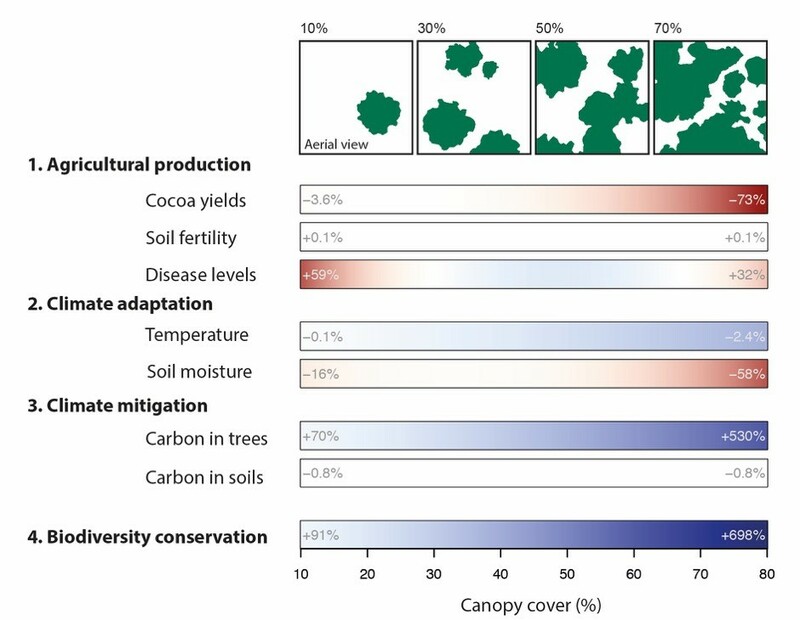 One way to solve this problem is to simultaneously quantify as many of the presumed costs and benefits of agroforests as possible in a single study, and importantly, to take these measurements along a gradient of shade-tree cover all the way from no-shade cocoa monocultures through to high-shade cocoa agroforests. And so, this is what we did. 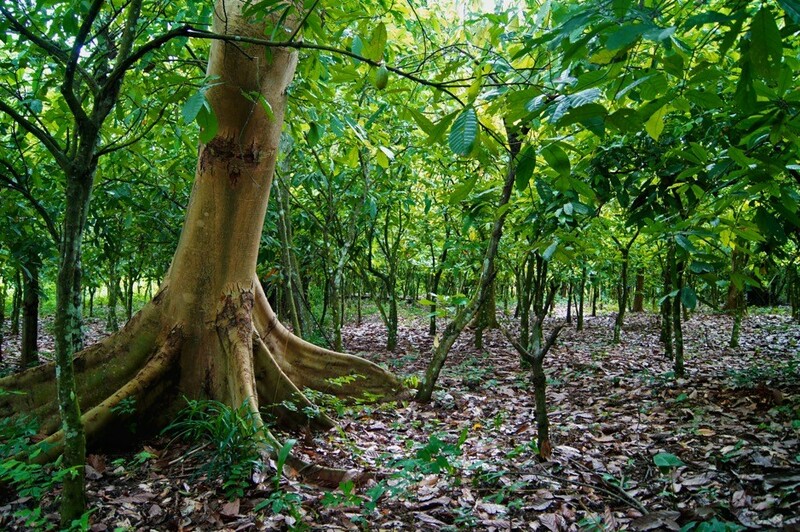 Our goal was to figure out exactly what cocoa agroforestry can and cannot do, and to provide clear management recommendations for optimum levels of shade-tree cover that can simultaneously capitalize on the potential benefits of shade trees for the provisioning of ecosystem services, while continuing to produce cocoa for smallholder incomes and to meet rising demand. Cocoa agroforests up to 30% cover are far superior to monocultures, but higher levels of shade tend to generate larger costs. The two years of intensive fieldwork in Ghana that were required to answer our question were challenging but yielded a relatively clear result: Low-to-intermediate shade agroforests around 30% cover are ideal for optimizing the trade-off between agricultural yield and the provisioning of other ecosystem services. Indeed, we found that cocoa yields need not be compromised under this level of shade, and such agroforests have several other major advantages over monocultures. As shade-tree cover increases above approximately 30%, agroforests become increasingly less likely to generate win-win scenarios. This is mostly caused by the negative effects of shade trees on cocoa yields due to a reduction in light and competition for water. In sum, our results suggest that cocoa agroforests of approximately 30% cover are far superior to monocultures because they do not strongly compromise production, while providing benefits for disease management, climate mitigation and adaptation and biodiversity conservation. This demonstrates that careful management of the level of shade could yield more favorable outcomes for smallholders than the current ad hoc implementation of agroforestry or the trend towards full sun monocultures. The effects of agroforests on agricultural production, climate adaptation, climate mitigation and biodiversity along a gradient of shade-tree cover. Adopted from Blaser et al., Nature Sustainability 1, 234–239 (2018). Sustainable production will likely require additional effort beyond simply managing for optimal shade levels. 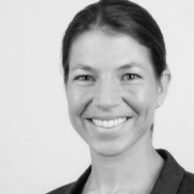 We hope our study represents a useful step forward for improving the sustainability of cocoa production in agroforests, but we also know that there remains much more work to be done. While we were able to simultaneously measure many production, climate and sustainability variables across multiple growing seasons and under a large range of shade levels, there are a number of other factors that we did not explicitly consider that may also be important. For example, optimal shade levels may depend on the climate in a particular growing region, and will also likely depend on the way that farms are managed. Indeed, improvements in the management of cocoa trees within agroforests may allow yields to be maintained at even higher levels of shade than our conclusions suggest, while also increasing many of the benefits of agroforests that we document. This is a tantalizing prospect that deserves future research attention. It is also possible that careful selection of diverse shade-tree species, and shade-tree species with particular characteristics may improve the effectiveness of agroforests. 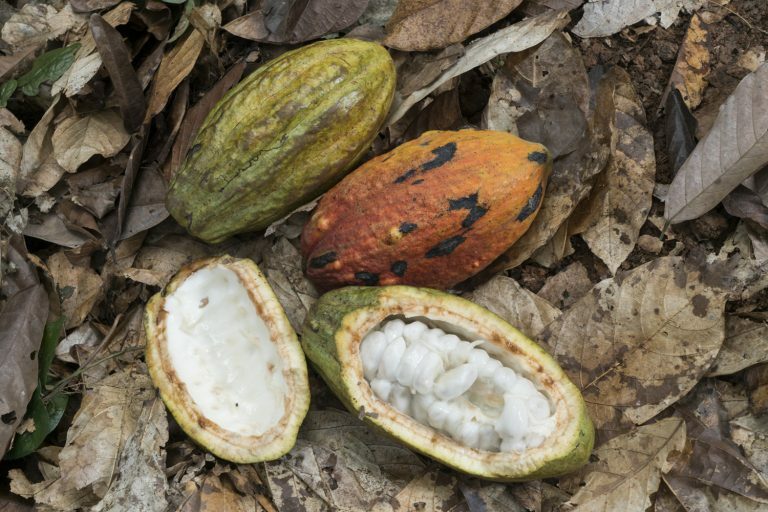 Finally, the overall economic performance of cocoa agroforests – which is of critical importance to the livelihoods of smallholder farmers – could also be improved by including species that can be harvested for timber, fruit or other products. Agroforests cannot replace natural forest ecosystems. It is important to recognize, however, that our work only hints at a whole different set of trade-offs between agricultural production and biodiversity, and agricultural production and climate. For example, while our work shows that agroforests have clear benefits for climate mitigation and biodiversity conservation relative to monocultures, agroforests do not come close to the carbon storage capacity and levels of biodiversity in undisturbed forests. Even the best designed agroforests are unable to maintain all of the ecosystem services provided by the natural ecosystems that they replace. Nevertheless, the benefits of agroforests are substantial and they represent a viable solution for meeting production and sustainability goals in landscapes with little remaining primary habitat.